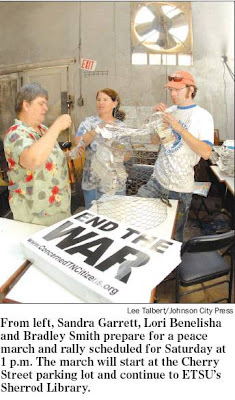 On the front page of today's Johnson City Press, we find Groups to Unite for March, Rally, Calling for War's End. I am one of the speakers, as the article states, along with Joseph Fitsanakis and Iraq War vet, Jason Hurd. I didn't want the name of my congregation listed in the article, but the reporter added it anyway. The reason is that I speak not on behalf of my congregation (folks have different views) but only myself as a minister. Hi ho. So it goes. Nice cake - make the stand man - we need peace! That's not a cake, it's a bunch of yard signs we will have available at the rally. But what a great idea! Too bad it's too late to order one now. That would have been really cool. Next time. It does look like a cake! It is peace cake. The recipe is to get vocal about ending this war! Keep checking Shuck and Jive or concernedtncitizens for updates on today's rally!